Liverpool started their premier league campaign with a 3-3 draw away at Watford. The Reds would have run away with the victory save for injury time equaliser by the host. Watford opened scoring in the 8th minute of the match through Stefano Okaka Chuka. Jose Holebas swung in a sumptuous corner into the six yard box. Big man Stefano Okaka is unmarked and plants a header into the net. Goalkeeper Simon Mignolet got a hand to it, but Okaka’s header was too powerful. Sadio Mane equalised for Liverpool in the 29th minute of the game. Mane was at the heart of it, collecting the ball around 30 yards out and engaging a couple of Watford defenders. He pops the ball off to Alberto Moreno, who nudges it inside and Mane runs over it. In an instant, Emre Can plays it through on goal for Mane, who composes himself and angles a stunning finish into the top corner of the net. Within a couple of minutes of conceding, Watford are back in front in the 32nd minute of the game. Abdoulaye Doucoure starts the move by laying the ball on to Stefano Okaka – who is offside. The play is allowed to go on though, Trent Alexander-Arnold falls over in trying to clear a cross into the box and Doucoure can calmly slot into the net from a few yards out to finish what he began, making it 2-1. Liverpool got a penalty in the 55th minute of the match. Roberto Firmimo made no mistake as he slotted the ball into the net to make it 2-2. Two minutes later, Liverpool turn the game around. Roberto Firmino takes down Dejan Lovren’s long ball and knocks the ball over the onrushing Heurelho Gomes. It is about to nestle in at the back post, but new signing Mohamed Salah makes sure by thrashing the ball in from all of two yards out to make it 3-2 for the visitors. 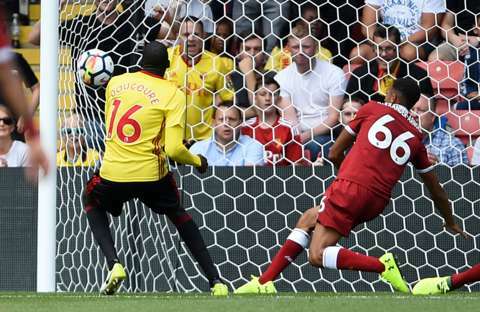 Miguel Britos equalised for Liverpool in the injury time of the game to rescue a point for Watford.